Soup and sweater weather has arrived in the South East US this week. Tomatoes and sweet onions are giving way to root vegetables- sweet potatoes being a special favorite of mine for the way their sweetness complements savory dishes. We love them roasted as sweet potato fries, and mashed into vegetable cutlets. The combination of sweet potatoes and legumes is wonderful- some of our favorites include black beans and sweet potato quesadillas and burritos, sweet potato and vaal dal and sweet potato hummus. Yesterday, I was in the mood for soup but not so much in the mood to spend time making it. The oven came to the rescue for hands-free cooking, as it often does. I thought of the roasted onion and garlic soup that I make once in a while. You roast vegetables, then puree them with stock. Ta da. You have soup. 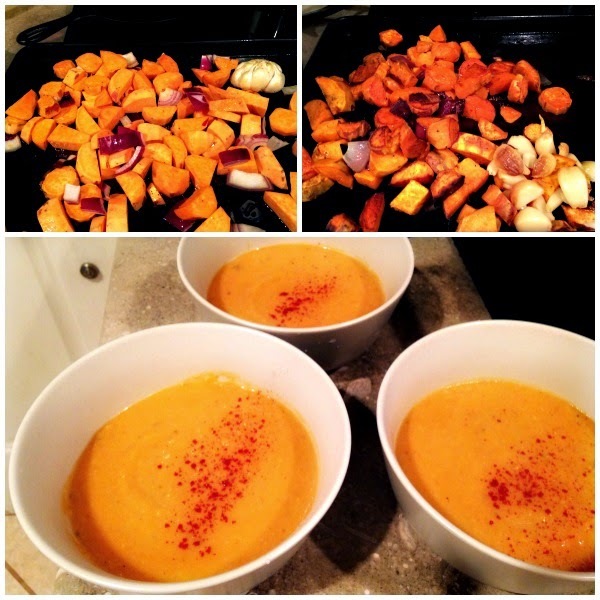 I used the same principle to make this easy sweet potato soup. I was out of vegetable stock, nutritional yeast, bouillon and all such soup basics. A pantry restocking is in order, clearly. Anyway, I went ahead with only milk and water as the base of the soup, with some smoked paprika to add flavor. It worked just fine. You can tell that this is a flexible recipe. 1. Pre heat oven to 425F. If you have a convection setting on the oven, you'll want to use it- it will cut roasting time significantly. 2. Peel 3-4 sweet potatoes and chop them into chunks. Peel and chop 1 large onion into chunks. Take a head of garlic, separate into cloves (no need to peel the garlic cloves now). 3. Place all the vegetables together on a sheet pan. Toss with olive oil, salt and pepper. Roast until the vegetables are browned and soft. 4. Pop the garlic cloves out of their peels. Place all roasted veggies in a pot. 5. Add 1 tsp. smoked paprika, 4 cups water and 1/2 cup milk (or cream or a combination) to the vegetables and blend them into a smooth puree. Add more water if required. Bring to a boil and simmer for 5 minutes. 6. Taste and add more seasoning if required. Serve hot with a squeeze of lemon or a dollop of yogurt/sour cream and a sprinkle of paprika. Are you fond of sweet potatoes? What's your favorite way to cook them? Oh, and do you have a must-try soup recipe to recommend? Edited on Feb 2, 2018 to add another version of a roasted sweet potato soup. This one is vegan, with warm curry spices and coconut milk. 1. Pre-heat oven to 400F. If you have a convection setting on the oven, you'll want to use it- it will cut roasting time significantly. 2. Peel 2-3 sweet potatoes and chop them into chunks. Toss on a sheet pan with olive oil, salt and pepper. Roast until the sweet potatoes are tender and slightly browned. 4. Add 1 cup coconut milk to the masala and simmer for a few minutes. 5. Then in a blender, blend the roasted sweet potatoes, masala with coconut milk smoothly with enough water to make a soup of your desired consistency. Warm the soup and enjoy! I like sweet potato fries and also sweet potato in African style stew with peanut butter -- yumm!! Your sweet potato soup looks hearty and delicious. Sweet potato with peanut butter in an African stew sounds just wonderful. I must try this. Simple and soulful. There's nip in the air over here in San Diego too - this would be perfect for a weeknight meal. My girl loves sweet potatoes, and so do I. So I've been preparing it on a regular basis - thin slices roasted in ghee and then cooked with a little bit of sugar. My girl ate a lot of this soup too! Sweet potatoes- what's not to like, right? My favourite go to soup recipe is actually one I saw on your blog :) Its the Alice Waters roasted cauliflower soup. I've made it following the recipe to the letter as well as winging it based on ingredient availability. It has never failed to deliver! For sweet potatoes here are two of my favourite ways to prep them..
Its endlessly versatile and can be subbed with other ingredients (olive oil instead of butter, other herbs instead of sage) without imparing the taste in any way. I haven't made that cauliflower soup in a while- you've reminded me, Janani! That stir fry is so interesting, very much like the kees we make in Maharashtra but without the peanuts. Must try it. I don't use sage enough. I cook sweet potatoes like sabudana khichdi. chop and make small pieces of sweet potatoes. not the size that gets mushed, but not large either. take oil in a pan and throw in cumin seeds. once it splutters, add chopped green chillies and curry leaves. when they splutter, add the sweet potatoes. cover and cook. Omit the green chillies for kids in the house. When 70-80% cooked, add crushed peanuts (dry roast peanuts before crushing them). Cover and let steam cook the sweet potatoes. Finally add lemon juice and chilli powder to balance the sweetness of the sweet potatoes. Garnish with cilantro. Oh now that sounds just wonderful. Thanks for sharing this recipe idea. He also has a video of the same recipe on youtube. Roasting chunks of sweet potatoes gives it a nice crust and great texture in the chili. It is melt in the mouth soft but doesn't fall apart while mixing. Your picture with 3 bowls of soup reminded me of the story of Goldilocks and the 3 bears :-)) only it had 3 bowls of porridge but I am sure this soup would have pleased Goldilocks too. It looks warm and comforting. Perfect for this season! I just pressure cooked all the ingredients together and pureed it. I didn't feel the need to add any cream. We will make it again and again. I'll take soup over porridge any day, and I think Goldilocks would agree with me :) Thanks for the soup links- both look wonderful and easy to do. Yum.. this looks great. Roasted sweet potato slices topped with pumpkin seed pesto. I have pumpkin seeds that I need to use up- pesto is a good idea! Nupur, welcome back! I’ve been following your blog, just didn’t write anything because the blog has been inundated with comments. I also read Cottons though I am “challenged” in that field. My favourite Sweet Potatoes ( known as Kumera in Australia) recipe is Kees. The whole family loves it. Wishing you and V and Lila a very happy, joyful, peaceful, safe, healthy and prosperous Diwali. Kumera- I had no idea sweet potatoes had a different name in Oz. Happy Diwali to you all too! My favorite sweet potato dish is total simplicity. Use sweet potatoes the size of Russet baking potato. Give them a good scrub, wrap in aluminum foil and bake until done. Top with a pat of butter,a sprinkle of salt and dig in. Yum! I'm not really a soup person but I absolutely love Moroccan lentil soup. With some crusty sourdough, it's the stuff yummy dreams are made of. I like ratala kees too- but I use the food processor to grate mine. Does that count as a workout ;) I've had harira (Moroccan lentil soup) at a friend's home and it was wonderful. I am a sucker for soups! And fall is my favorite season :) My favorite soup is vegetarian pho. The broth based Vietnamese soup. I have made it at home 2-3 times in the past years, but it does take lot of prep, especially if you are going to make the broth at home (which is highly recommended). Other few favorites are roasted veggie soup (which is made like your sweet potato soup, but with a different veggie), indo chinese corn soup, and cabbage-carrot soup (I forgot how I had made this, though.. will have to search for the recipe online. But I couldn't believe pureed cabbage could taste this good!). I am not a big fan of dairy in my soups, but occasionally I do like the panera bread tomato cream soup. Hi Neha, could you please share the recipe/link of your favorite vegetarian pho soup. I would love to try it. Thanks! 1) skipped the mushrooms, both in broth and pho as I do not like mushrooms. 2) in the broth, I sauteed the veggies before boiling them. also, I added many other veggies to the broth..scraps and left over odds and ends of vegetables in the fridge. 3)I also generally add wonton dumplings to the pho. (wonton wrappers stuffed with minced sauteed veggies and baked in the oven till crispy). My favorite pho place in the bay area has pho with such dumplings and it takes the humble pho to another level. Thanks Neha. I am definitely going to try this. I liked your idea of sauteing the vegetables before making the broth and I also love wonton dumplings. I have to try the pho too! And I've never made cabbage soup. Bad associations with deprivation diets. That might be something to try as well- I can see how it could be tasty. I have to try this. It looks so good and I'm a fervent sweet potato fan too. Also a soup fan. Pea, corn and shiso soup although, let's face it, I make it with mint more often than shiso. Another favourite is this one Garlic soup because I always have everything on hand, except the fat, so I use ghee. I sometimes boil bits of carrot or string bean in it and it becomes a hearty meal. Oh yes, dal and amti slurped from a bowl all by itself is a wonderful treat on a cold evening. Thanks for the wonderful links! Happy Diwali to you all too, R!! Will mail soon! We have been eating fennel soup every week! It is such a simple recipe - http://therichvegetarian.com/fennel-soup/. Adore sweet potatoes. A friend of mine cooked up halva using them and it was fabulous. I have two recipes up on my blog. One is my Mom's invention (http://therichvegetarian.com/sweet-potato-coconut-mash/) and the other is inspired by Madhur Jaffrey (http://therichvegetarian.com/sweet-potatoes-with-dried-fenugreek-inspired-by-madhur-jaffrey/). I rarely buy fennel- I'm not so much in love with anise taste in food. Does it taste very anisey? Thanks for the links- the sweet potato recipes look wonderful! I don't know what anise-y means! Fennel tastes very clean and simple to my palate. It has a certain lightness and delicateness that I adore.